Yikes -- the body is weak but the spirit is happy? As I drove to and from the grocery store this afternoon, CBC Radio (yes, the Canadian Broadcasting Corporation) had a repeat of a long segment on microbes, with specific focus on gut microbes, including a reference to Crohn's. And I thought of you. Hope the meds, liquids, heating pad, Happy Chair and stitching help you feel better. P.S. I bought "all" the meat -- chicken breasts, pork chops, sausages and ground turkey -- because it was all on sale. And maybe I felt the need for protein?! I am SO sorry! I had that once -- and wound up in hospital on morphine. God Bless you -- I hope the flare up is over soon! Chronic illness is always with us, unfortunately, but if we can be ill and still be 'happy', that's just a blessing. In that you're enjoying your house stitchery and planning something new, it looks like you've gotten the "soldiering thru" thing down. God bless you, my dear, and this too shall pass. Rats, rats, rats. I'm sorry to hear about the flare up. But your capacity and willingness to maintain good humour on your blog even while reporting it is inspiring. The project is a really neat one. Hope the body rebounds soon!! You are sounding settled and relatively comfortable for today... Hoping the glitch in your carefree feelings subsides and that you will be up and ready to meet tomorrow's challenge. I'm sorry Coni. If I could figure out how to wiggle my largish, not so cute nose like Samantha wiggled her cute, little nose - I would. But methinks that the seatbelt needs a bit of adjusting! 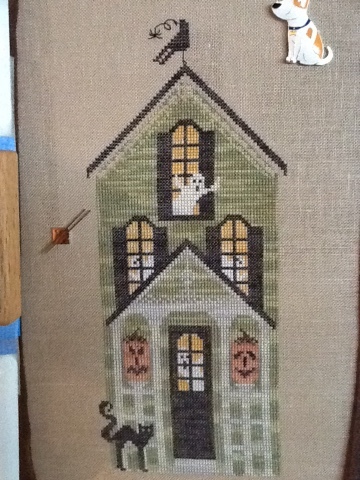 Enjoy stitchy chair time - and I love the color of the house! Oh Coni, I am sorry you are dealing with another bout of diverticulitis. Your stitch is looking swell. Oh man! Hope you are feeling better now. And your house looks superb!